A body that absorbs all the radiation falling on it, i.e. a body that has no reflecting power. It is also a perfect emitter of radiation. The concept of a black body is a hypothetical ideal. The radiation from stars, and their effective and color temperatures, can however be described by assuming that they are black bodies. where the wavelength is measured in micrometers. This is known as the Wien displacement law. 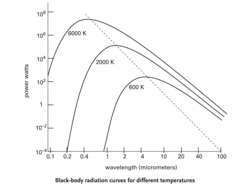 The radiation from a hot black body is greater at every wavelength than the radiation from a cooler black body. The total radiation flux thus increases rapidly with increasing temperature, as described by Stefan's law. h is the Planck constant, k the Boltzmann constant, and c the speed of light. Stefan's law and the Wien displacement law can both be derived from Planck's law. Planck's radiation law describes only the continuous spectrum emitted by a black body. The continuous radiation from a star, as opposed to a black body, does not usually follow Planck's law exactly, although over a broad region of the spectrum the law is a good approximation.